Poor handling is a real attack killer for young players. Good attacking play can easily be slowed down by poor passing or fumbled attempts at catching. Here are four different activities and sessions to develop the sort of skills aimed at encouraging better basic handling for less experienced players. First, let’s have a race. In the VIDEO: Passing race, you can see the players thinking for themselves how they might win the “race”. Notice how they change their hand positions and think about the follow through to the target. I’ve found Tag ball tag for creative passing solutions allows the players more freedom to consider what passes make the most difference. They will experiment, make mistakes, have fun and move the ball around. 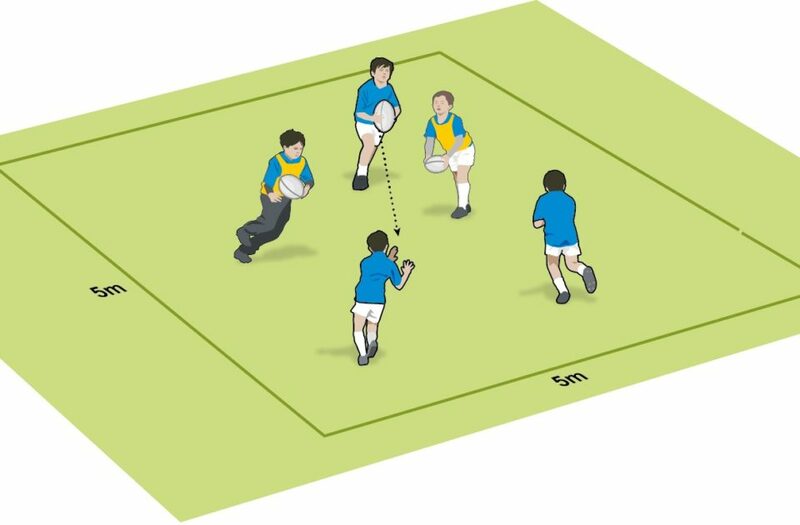 When they are playing tag rugby or the first few years of low tackling rugby, they will be passing out of the tackle as much as before the tackle, so they need to adapt how they pass more than we think. Once the players have become more adept at passing, you want them to be running onto the ball. The passing race above starts that process. The Passing pace activity from our Easicoach Curriculum takes it to the next stage. Finally, passing is about finding the supporting player with the pass. While the Passing pace activity has the supporting players running in straight lines, mix up the session with Angling for the next pass. This is also from the Easicoach Curriculum.